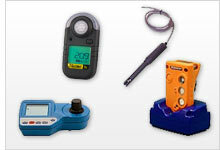 In the diverse PCE range you will find an oxygen meter for water and gases. We have available an oxygen meter for water for both pure oxygencontent and for oxygen concentration. The oxygen meter for water and gases has a water resistant design, interface and internal data memory as well as the classical version for laboratories. The oxygen meter for gases follows the security norms and is used for detection and measurement of methane, hydrogen sulfide, carbon monoxide and oxygen (as well as 50 more gases). The PCE-PHD 1 Oxygen Meter is a portable and effective measuring device with multiple capabilities for inspecting water quality. Offering extraordinary precision at an affordable price, the Oxygen Meter is used for laboratory and in situ testing of the pH value, redox, conductivity, salt content, oxygen level and temperature of water. The oxygen meter is a simple measuring instrument that allows measurement of oxygen content, oxygen saturation and sample temperature. The oxygen meter directly reports measured values in real time via the display. The Xgard-1-O2 is a single-gas Gassensor used to warn for gases (Oxygen, O2, 0 ... 25 vol%), with display and signal output for sensors in combination with a stationary instrument to detect gases (ATEX or UL approval). The TXgard-IS+O2 is a single-gas Gassensor used to warn for gases (Oxygen, O2, 0 ... 25 vol%), with display and signal output for sensors in combination with a stationary instrument to detect gases (ATEX or UL approval). The TXgard-Plus-O2 is a single-gas Gassensor used to warn for gases (Oxygen, O2, 0 ... 25 % vol), with display and signal output for sensors in combination with a stationary instrument to detect gases (ATEX or UL approval). A chemical formula O2 is knows to absolutely everybody. Life without oxygen is impossible and there is a belief that the more oxygen comes into the lungs, the better it is for health. In daily life we all strive to get to the areas where we can breathe fresh air and get oxygen instead of traffic exhaust and gases. Monitoring of the oxygen amount in the air is, nevertheless, extremely important, since it is not always that harmless and too much oxygen in the air may indicate a dangerous situation. It cannot be seen, unless it is in its cooled condition (when it turns into a blue liquid), it cannot be smelled, tasted. How much oxygen is present in the air can never be determined and measured without auxiliary equipment. The oxygen meter is an indispensable device at the enterprises and industrial facilities where the risk of the unexpected and undesirable oxygen release into the air exists. The leakage of oxygen may lead to an explosive hazard and, thus, must be prevented in any case. Positioning of the oxygen meters near the potentially dangerous places helps to carry out continuous monitoring of the content of oxygen in the air. Immediately after the permissible limit is exceeded the alarm sounds as a notification that the amount of oxygen is in the air is dangerously high. Oxygen (O2) is present in the atmosphere, air, many substances and living organisms and their cells. Besides, it is also present in pretty big amounts in the water. That is why to assess the water body (fresh or salty water), as well as wastewater it is necessary to know the amount of the dissolved oxygen (DO) in each particular case. In the natural surroundings, there are many factors influencing the oxygen content in the water: the interaction with the atmosphere, when the oxygen is absorbed from the air, photosynthesis (especially when rich flora is present), the temperature, pressure and, of course, the amount of salt in the water, as well as the flow, if any at all (the flowing river and the stagnant lake water will have different values, since the faster the water flows, the higher is its saturation with the oxygen). The purity of water as well as the number of inhabitants (fauna) also influence the DO concentration in the water. Unusual weather and natural phenomena, like extreme heat or cold temperatures, excessive contamination of water with waste, dangerous elements or organic substances lead to the reduction of the oxygen concentration, which in its turn, brings aggravating consequences, such as unfavourable living conditions for the organisms or poor quality of the water meant for household drinking purposes. The measurement of the oxygen concentration in the water may tell a lot and is required to be able to evaluate the ecological situation in the area, the quality of the water, if it goes about food production, or the deviations from the sanitary norms. It applies not only to the natural water resources but also to industrial production and water-treatment plants. Control of the oxygen concentration in the water, for example, is important to provide the best working conditions at the factories and avoid excessive corrosion of the pipes, which may be caused by very high concentration of this element in water. Oxygen meters applied provide accurate results very fast which move them to the foreground in comparison to the traditional Winkler method. Application of the portable meters provides the possibility of determination of the dissolved oxygen concentration as well the temperature of the sample. The results of the measurement may all be seen on the display. The processes connected with the water treatment in the industrial facilities are very expensive and that is why the precise and reliable measurements carried out with very sensitive oxygen meters contribute a lot to the improvement of efficiency.